Mohamed Salah took his tally to 40 for the season as Liverpool maintained their push for a top-four finish with a 3-0 win over AFC Bournemouth at Anfield on Saturday night. The Egyptian glanced in a fine looping header from Trent Alexander-Arnold’s precision cross in the 69th minute to further the Reds’ advantage against the Cherries. Sadio Mane had set the home team on their way to three points early in the first half when he fired home from close range after having an initial effort saved. Roberto Firmino wrapped up the scoring in the final minute, netting with a neat reverse shot inside the near post. 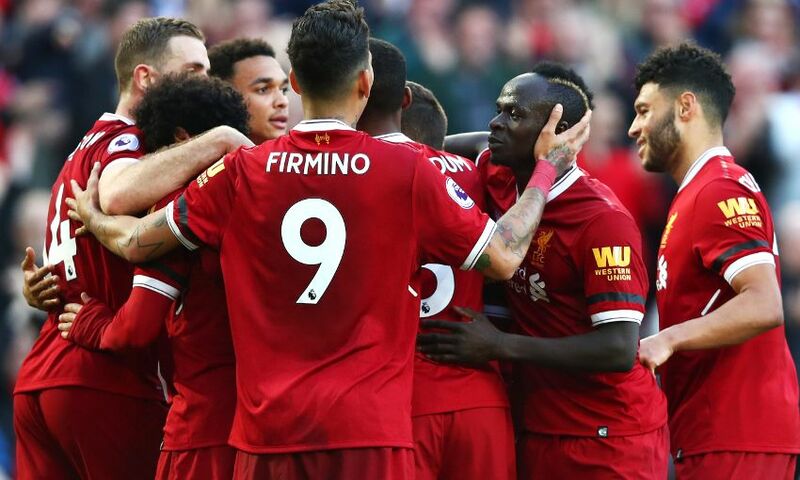 The result ensured Liverpool consolidated their position in third place in the Premier League standings with four games remaining. Jürgen Klopp made just one change to his line-up from the midweek win at Manchester City as Jordan Henderson returned to the midfield, replacing James Milner. Prior to kick-off, Anfield paid tribute to the memory of the 96 children, women and men who lost their lives at Hillsborough with a minute’s applause and a mosaic on the Kop, with Sunday marking the 29th anniversary of the tragedy. Liverpool could have taken the lead inside the first three minutes when Salah – perhaps somewhat uncharacteristically – side-footed wide from Alexander-Arnold’s magnificent pass into the area. However, the hosts didn’t have to wait much longer to strike an early advantage as Mane opened the scoring, converting at the second attempt after his header from Henderson’s pinpoint ball was initially saved by Asmir Begovic. The Cherries’ goalkeeper foiled the scorer moments after, sprawling at his feet after he’d been sent speeding through on goal, while he also turned away a free-kick from Alexander-Arnold. Mane then arrowed wide of the near post and Salah clipped over after pouncing on a loose ball as Liverpool dominated the opening exchanges. There were further half-chances for Alex Oxlade-Chamberlain, Salah and Mane before the interval, but Bournemouth returned to their dressing room with only a one-goal deficit to contend with. The second stanza picked up where the first had left off, with the Reds in complete control. Virgil van Dijk narrowly cleared the crossbar with a drive from distance; however, chances were proving more difficult to come by as Bournemouth regrouped. Nevertheless, the pressure finally told on 68 minutes when Salah converted his 40th goal of a sublime season. The Egyptian’s finish was a delight as he looped a header over Begovic from 12 yards, but it owed much to a majestic arching pass from Alexander-Arnold from the right touchline. Firmino spurned an opportunity to enhance Liverpool’s lead when he rounded Begovic, only to have a shot blocked on the line, while Loris Karius was called into action to thwart Dan Gosling’s close-range whack after the ball fell invitingly inside the area. Substitute Callum Wilson then struck across goal and wide as Bournemouth mustered a late response, but Firmino wrapped up the scoring when he rolled a shot inside the near post from Oxlade-Chamberlain’s pass at the conclusion - the 300th scored during Klopp’s tenure.